IRS has published 2019 Federal Tax Table. You can view the latest tax rate here. ezPaycheck 2019 has been updated to implement the following changes. 1) Annual Withholding Allowance per dependent increased from $4,150 in the year 2018 to $4,200 in the year 2019. 2) Social Security and Medicare tax rate unchanged. The social security wage base limit is $132,900, increased from 128,400 in the year 2018. 3) Tax brackets updated in the year 2019. New clients are welcome to download and test drive ezPaycheck software for 30-day free with no obligation. If you are current ezPaycheck 2018 user, do NOT install this new version before you complete 2018 paychecks. ezPaycheck 2019 installation will update the tax tables. With ezPaycheck 2019, you can still access your 2018 paychecks, view reports, and print 2018 W2 forms. If you have completed 2018 paychecks, you can use ezPaycheck 2019 to print 2018 W2 and 940 forms. You do not need to roll back to the previous version. If you have NOT completed 2018 paychecks, you can follow the steps below to roll back to ezPaycheck 2018 version. Your data should be safe during this process. However, we always suggest customers back up data before downloading the new version. ezPaycheck 2019 installation package will update ezPaycheck tax tables. You should run it after you completed the paychecks for the Year 2018. With the current version of ezPaycheck 2019, you can still access your 2018 paychecks, view reports, and print 2018 W2 forms. We just released the new edition of ezPaycheck payroll software. This new version includes the updates of 2018 tax form W2, W3. Current clients can download this new version for free. ezPaycheck speeds up payroll processing and paycheck printing for small businesses. New clients are welcome to download the 30-day free Demo version and try it with no obligation. Customers seeking a way to simplify payroll processing with more accuracy are welcome to test drive ezPaycheck payroll software for 30-day free with no obligation. ezPaycheck comes with the manual check and manual YTD features which make it easy for new clients to switch to this payroll software anytime. ezPaycheck makes small business payroll an easy job! The Electronic Federal Tax Payment System (EFTPS) is a free service from the U.S. Department of the Treasury. All federal taxes can be paid using EFTPS. Here is the guide about how to enroll this system and make the tax deposit by yourself. If you hire third-party payroll service providers, you should monitor deposits made on your behalf for accuracy to ensure the third-party payroll service provider makes accurate and timely federal tax deposits. Please watch this video from IRS. If you have completed 2017 paychecks, you can use ezPaycheck 2018 to print W2 and 940 forms. You do not need to roll back to the previous version. If you have NOT completed 2017 paychecks, you can try the following steps to roll back to ezPaycheck 2017 version. Your data should be safe during this process. However, we always suggest customers backup data before downloading the new version. ezPaycheck 2018 installation package will update ezPaycheck tax tables. You should run it after you completed the paychecks for Year 2017. With ezPaycheck 2018, you can still access your 2017 paychecks, view reports and print 2017 W2 forms. IRS published the new Year 2017 Form 940. We released the new editon of ezPaycheck 2017 with the latest tax forms today. Current ezPaycheck 2017 clients can download the new version for free. New clients are weclome to download and test drive for 30 days with no obligation. ezPaycheck payroll software bundle version for year 2017 and 2018 has just been released for a limited time from Halfpricesoft.com. The bundle version is being offered at a special cost of only $119.00, per installation (Regular price: $198.00). ezPaycheck comes with the manual check and manual YTD features which make is easy for new new clients to switch to this payroll software in mid-year. Customers seeking a way to simplify payroll processing with more accuracy can go online to http://www.halfpricesoft.com/payroll_software_download.asp and download the payroll accounting software. The download includes the full version of the paycheck software along with a sample database. The sample database allows new customers to try all of ezPaycheck’s exciting features, including the intuitive graphical interface, without wasting time entering data. IRS published the 2017 Tax Form W2 and W3. We have updated ezPaycheck payroll software with the latest tax forms. - Current ezPaycheck 2017 customers can download this new version for free. As a precaution, please back up your payroll data before you install the new version. - New customers are welcome to test drive the 30-day free trial version with no obligation before purchasing it. 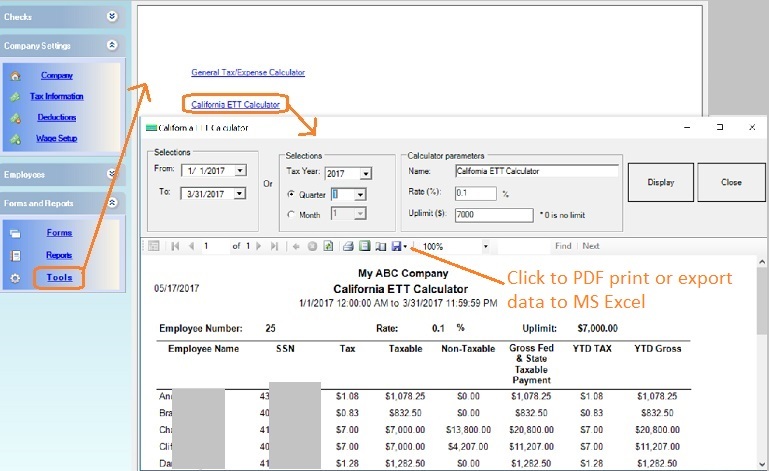 New ezPaycheck 2017 edition is released with new tax tools, such as ETT tools. Current ezPaycheck 2017 customers can download this new version for free. The new edition of ezPaycheck 2017 is released with the latest Form 941, Employer's QUARTERLY Federal Tax Return. Current ezPaycheck 2017 customers can update payroll software for free. New customers are welcome to test drive and purchase. Karen is married, with 1 allowance. Her salary rate is $39000. She gets one pay check each month. EzPaycheck payroll software is designed to automate paycheck processes to reduce the time spent on running payroll. The software’s graphic interface leads users step-by-step through setting up employee information, importing data, calculating payroll—including calculation of federal, state and local taxes; deductions for Medicare, insurance and 401(k) plans; and printing paychecks. The 2017 edition of ezPaycheck payrioll software is available. This edition inncludes the latest 2017 tax tables from IRS. It also includes the latest year-end W2, w3, 941 and 940 forms. New customers are welcome to download the 30-day free trial version and try it for free with no obligation. DIY EzPaycheck payroll software from halfpricesoft.com speeds up payroll tax calculations, paycheck printing and tax form reporting for small business. To make this payroll software affordable to more small business owners, a new limited time price reduction for ezPaycheck 2016 and 2017 bundle version at only $99.00 (regular price $178). This means new customers can get ezPaycheck 2017 version at $10 when purchasing the 2016 edition at the regular price. If you are current ezPaycheck 2016 user, do NOT install this new version before you complete 2016 paychecks. With ezPaycheck 2017, you can still access your 2016 paychecks, view reports and print 2016 W2 forms. If you have completed 2016 paychecks, you can use ezPaycheck 2017 to print W2 and 940 forms. You do not need to roll back to the previous version. If you have NOT completed 2016 paychecks, you can try the following steps to roll back to ezPaycheck 2015 version. ezPaycheck 2017 installation package will update ezPaycheck tax tables. You should run it after you finished the paychecks for Year 2016. With ezPaycheck 2017, you can still access your 2016 paychecks, view reports and print 2016 W2 forms. A new limited time price reduction for ezPaycheck 2016 and 2017 bundle version from Halfpricesoft.com has employers jumping for joy! Business owners can begin year to date payroll for 2016 immediately and have the updated software for 2017 when it is released at a special bundle cost of only $99.00 (regular price $178). This means new customers can get ezPaycheck 2017 version at $10 when purchasing the 2016 edition at the regular price. 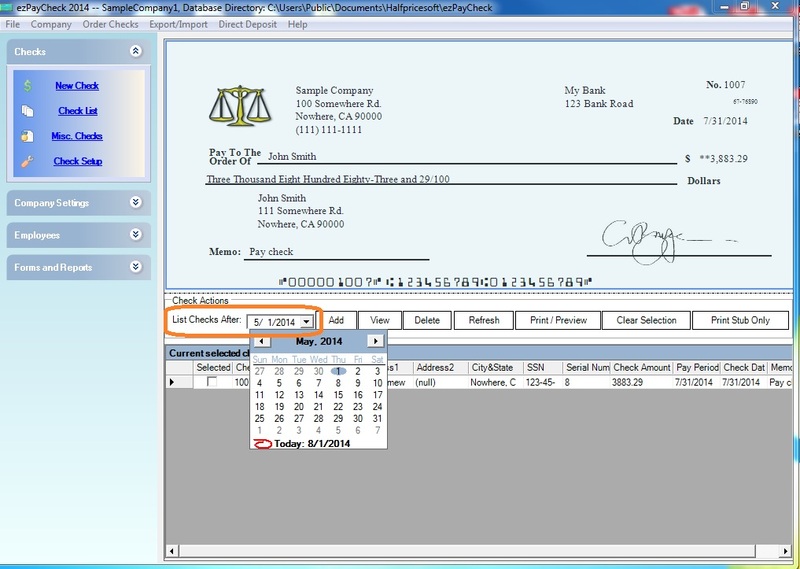 The easy to use and inexpensive graphical interface allows customers to print paychecks as well as W2, W3, 940, 941 forms all within one software application. We have released the new edition of ezPaycheck 2016 payroll software with the new 2016 year-end tax form W2 and W3. Current ezPaycheck 2016 payroll software customers can download this new edition for free. Here are the steps to update ezPaycheck payroll software. 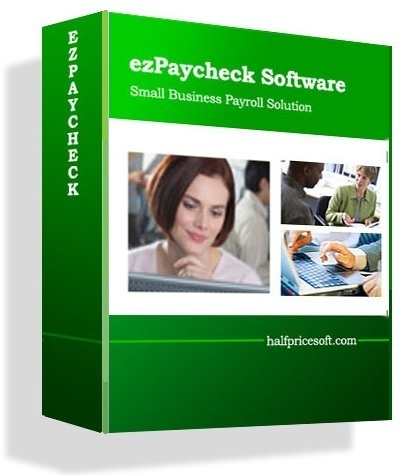 ezPaycheck payroll software makes payroll an easy job for small businesses. EzPaycheck business payroll software is an innovative application catering to to small and mid size business owners new to payroll processing. A new limited time price reduction for ezPaycheck 2016 and 2017 bundle version is available! You can begin year to date payroll for 2016 immediately and have the updated software for 2017 when it is released at a special bundle cost of only $109.00. EzPaycheck saves your time and money. You are welcome to download the 30-day free Trial version today! IRS published Notice 1036, Early Release Copies of the 2016 Percentage Method Tables for Income Tax Withholding. Here are some majors changes an employer should know for Year 2016 payroll processing. - For social security, the tax rate is 6.2% each for the employee and employer, unchanged from 2015. - The social security wage base limit is $118,500, unchanged from 2015. - The Medicare tax rate is 1.45% each for the employee and employer, unchanged from 2015. There is no wage base limit for Medicare tax. The new standard deduction for each dependent is $4050.00, which was $4000.00 in 2015. You can view 2016 Payroll Income Tax Withhold Tables here to see tax brackets changes and more details. Limited time offer of $20 discount for EzPaycheck 2015 payroll software is available for small business. The regular price of ezPaycheck is $89 per calenda year per installation. The new edition of ezPaycheck payroll software is available to support paid time leave feature. CA customers should download this new version. This update is optional for customers in other states. ezPaycheck payroll software does not allow customers to edit the SSN. All data inside database is linked by SSN and the change of SSN may cause tax calculation error. If you are still using ezPaycheck 2014 now, do not forget to update it to 2015 version before generating paychecks for Year 2015.
ezPaychchceck 2014 customers need to purchase the new license key to use ezPaycheck 2015 version. ezPaycheck 2015 is $89 per calendar year per installation. 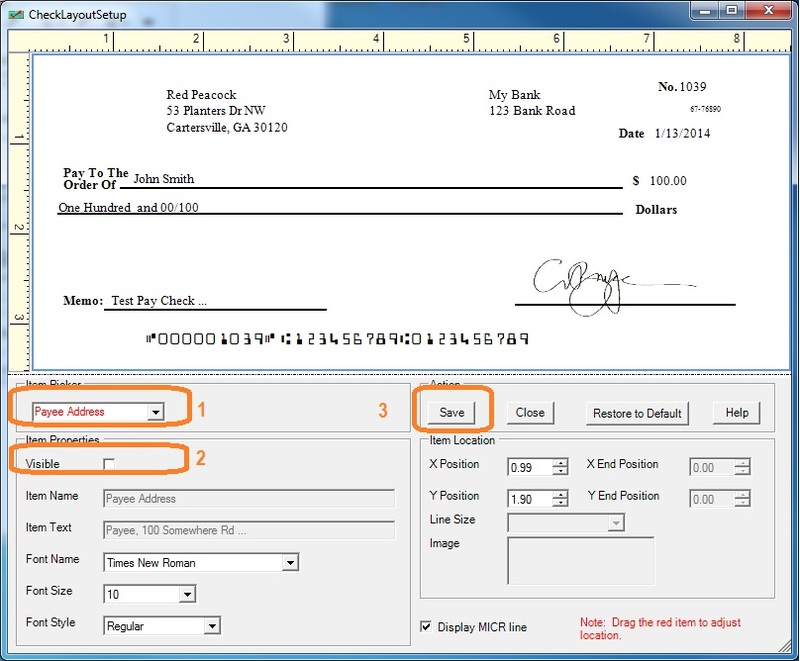 ezPaycheck 2015 version can access 2014 payroll data, print 2014 W2, W3, 940 and 941. Kevin is single with zero allowance. He is paid $240 per week. Karen is the employee of company ABC. She lives in Arizona. Her withholding rate is single/withhold at a single rate. She has two allowances and no extra withholds. She gets paid $10 per hour biweekly. She works 64 hours for each biweekly pay period. The standard deduction is $4,000 per year (For Year 2015). If you have finished 2014 paychecks, you can use ezPaycheck 2015 to print W2 and 940 forms. You do not need to roll back to the previous version. If you have NOT finished 2014 paychecks, you can try the following steps to roll back to ezPaycheck 2014 version. ezPaycheck 2015 installation package will update ezPaycheck tax tables. You should run it after you finished the paychecks for Year 2014. With ezPaycheck 2015, you can still access your 2014 paychecks, view reports and print 2014 W2 forms. The 2015 edition of ezPaycheck payroll software (version 3.5.1) is available for small businesses, nonprofits and accountants. This version includes the latest 2015 federal and state tables. This version also updated W2 printing function to support 4-up format. Current 2014 ezPaycheck payroll software should download this version after you complete all 2014 paychecks. After you install this new version, you can continue to access your 2014 paychecks, print tax forms and view reports. IRS has published the new 2015 tax tables. We will updated ezPaycheck payroll software for small businesses with the latest tax rate. ezPaycheck 2015 will be availale to download around Dec 15, 2014. The new ezPaycheck 2015 single user version will be $89 per calendar year. New customers that wants to start computerized payroll are welcome to check the current special promotion of ezPaycheck 2014 & 2015 Combo. Customers can get ezPaycheck 2015 at just $10 if you purchase ezPaycheck 2014 at $89. Buy ezPaycheck 2014 payroll software at regular price $89 and get ezPaycheck 2015 version at just $10! A new limited time price reduction for ezPaycheck 2014 and 2015 bundle version is available for new customers this holiday season. Payroll software designed with small businesses in mind: Simple, reliable and affordable. ezPaycheck is the right in house payroll tax solution for small businesses to calculate taxes, print paychecks, generate reports and print tax forms. No internet connection is needed. Paying employees and seasonal contractors should NOT be headache for small businesses employers. Download ezPaycheck payroll software and print paychecks and tax forms today! In many states, employers may no longer need to print SSN on pay stubs. However, in state, employers need to print Social Security number. And some times an employee may ask employer for pay stubs with full SSN for a loan or other purpose. ezPaycheck payroll software for small business is very easy to use and filexible. When you set up your account, you can choose the option to show or hide SSN (Social Security Number) on payroll check stubs easily. Here are the steps to hide Social security number on paycheck stubs. 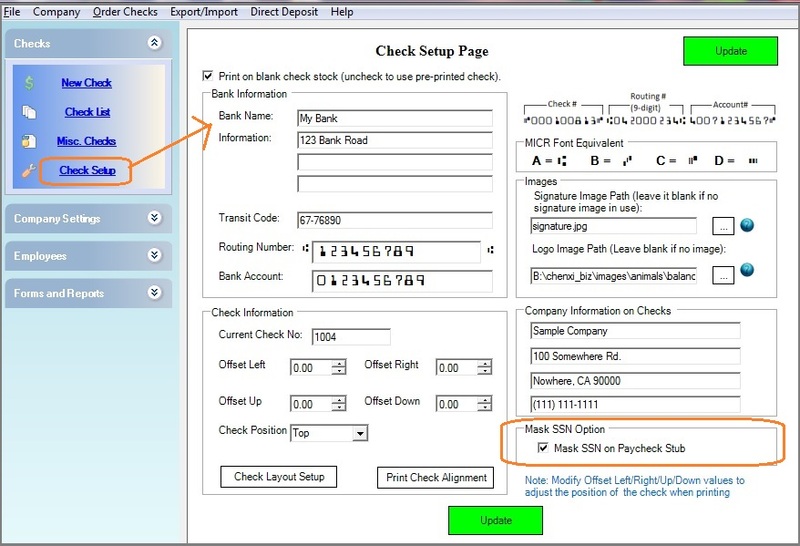 You can click the ezPaycheck left menu "Checks" then "Check Setup" to open check setup screen. Uncheck the option Mask SSN on Paycheck Stub to print Social Security Number on paycheck stubs. Click the update button to save your change. We have released the latest version of ezPaycheck 2014 payroll software with updates for W2 and W3 forms for the 2014 tax year. Current customers of ezPaycheck 2014 will receive the updates at no cost. EzPaycheck payroll software speeds up paycheck processing. It can also generates and prints Form 941. You can use Form 941 to report the following amounts. · Additional Medicare Tax withheld from employees. The Quarter Includes . . . If you are in . . . Without a payment . . . Question: I started my ezPaycheck payroll software this morning and I could not find any paychecks there. What should I do? Answers: Several reasons can cause this problem. Please check the instructions below. You can always find the current database file name and path from ezPaycheck top menu bar. 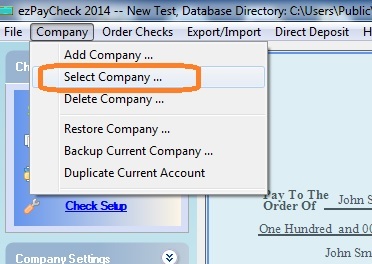 Step 3: If you have backed up your database file before, you can use the restore function to copy the data back. Note: This backup file is designed to be read by ezPaycheck payroll software. You cannot open it manually. Step 4: If you still cannot find your data, search "*.mdb" file on your machine. The database file is .mdb (Microsoft Access Database) file. If you can find it on your machine, you can use the restore function to copy it back. Note: This database file is designed to be read by ezPaycheck payroll software. You cannot open it manually. You can request livechat support from our support page. ezPaycheck payroll software help you process payroll taxes, print paychecks and file tax forms easily and smoothly. If you have not installed this software, you can download and try it free for 30 days with no obligation and no credit card needed. This paycheck software is compatible with Windows 8.1, 8, 7, XP, Me, 2003, 2000 and Vista system. The CA ETT (Employment Training Tax) is an employer-paid tax. Employers subject to ETT pay one-tenth of 0.1 percent (.001) on the first $7,000 in wages paid to each employee in a calendar year. The tax rate is set by statute at 0.1 percent (.001) of UI taxable wages for the employers with positive UI reserve account balances and employers subject to Section 977(c) of the CUIC. The maximum tax is $7 per employee, per year ($7,000 x .001). Since it is employer side tax, ezPaycheck payroll software will not withhold it from employee paychecks. And employees will not see the ETT on their paystubs. Union dues are the cost of union membership. Usually union members need to make the regular payment of money to fund the various activities which the union engages in. ezPaycheck payroll software is very flexible. As an employer, if you need withhold union fee from the employees’ paychecks, you can use the customized deduction feature. You can refer to this article for step by step guide on how to add a customized deduction by percent and withhold it from each paycheck automatically. Wisconsin income tax rate changed on April 1, 2014. “We’re going to start taking less out of your paycheck for withholding,” Gov. Walker said. EzPaycheck payroll software can calculate federal income taxes, state income taxes, social security tax, Medicare tax and other local taxes automatically according customers’ set up. However, ezPaycheck will NOT deposit the employments taxes to IRS and state treasury directly. Customers must deposit employment taxes to IRS, state and other local treasury departments themselves by mailing a check or using electronically funds transfer. You must use electronic funds transfer (EFTPS) to make all federal tax deposits. See the Employment Tax Due Dates page for information on when deposits are due. 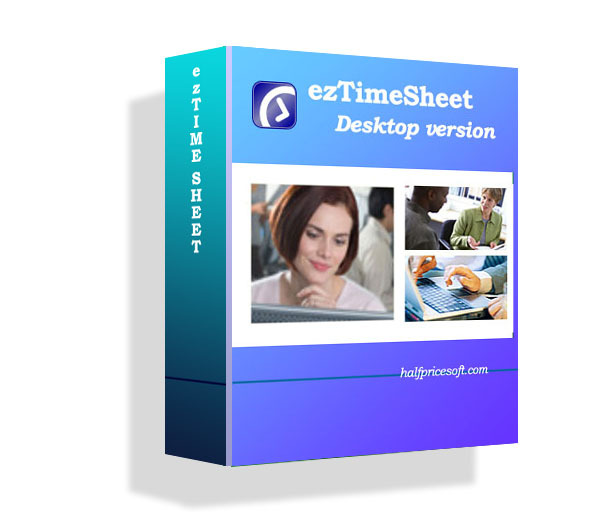 ezPaycheck payroll software is designed for Windows system. However, customers can run it on Mac machine installed with boot Camp, Virtual Printer or Parallels. Boot Camp comes with your Mac and lets you install Microsoft Windows. No need to download anything yourself — just open Boot Camp Assistant and it will guide you through the rest. Following are the steps to use Parallel with our program. Step 2: Install Windows (ie: Windows 7) on your Mac. Step 3: Install software (ie: ezCheckPrinting, ezW2). ezPaycheck payroll software is very flexible and allow customers to format the paychecks easily. Here are the steps to hide employee address on paychecks. The standard deduction is $3,950 per year (For Year 2014). · If you have NOT finished 2013 paychecks, you can try the following steps to roll back to ezPaycheck 2013 version. You can update it to 2014 version later. ezPaycheck 2014 update package will update ezPaycheck tax tables. You should run it after you finished the paychecks for Year 2013. With ezPaycheck 2014, you can still access your 2013 paychecks, view reports and print 2013 W2 forms.